The dolphins of Australia’s Shark Bay, famed as Earth’s first marine tool-users, likely turned to gadgetry because echolocation couldn’t find the best fish, especially for hurried moms without time to hunt. It was in 1984 that researchers first observed the dolphins fitting basket sponges over their beaks, then scraping through seafloor mud to disturb hidden fish. Research subsequently showed this behavior to be full-blown tool use, taught by mothers to their daughters and representing a profound difference in lifestyle between them and Shark Bay’s other bottlenoses. A basic question remained unanswered, however: Though sponges clearly protected sensitive dolphin snouts from jagged pieces of rock and coral, why scrape seafloor at all? Why not rely on echolocation to pinpoint target prey? In a study published July 20 in Public Library of Science ONE, biologists Eric Patterson and Janet Mann of Georgetown University set out to answer this question by mounting basket sponges on sticks and pushing them through Shark Bay seafloors, just as dolphins do. Most fish scared from the muck were bottom-dwellers lacking swim bladders, the air-filled organs that help fish control their buoyancy. Compared to fish flesh, which interferes with acoustic signals just slightly more than water, air bladders stand out on sonar. Without them, bottom-dwelling fish are nearly invisible to echolocation. Hence the value of scraping through seafloors manually, and thus the need for a device that protects dolphin noses from scraping. 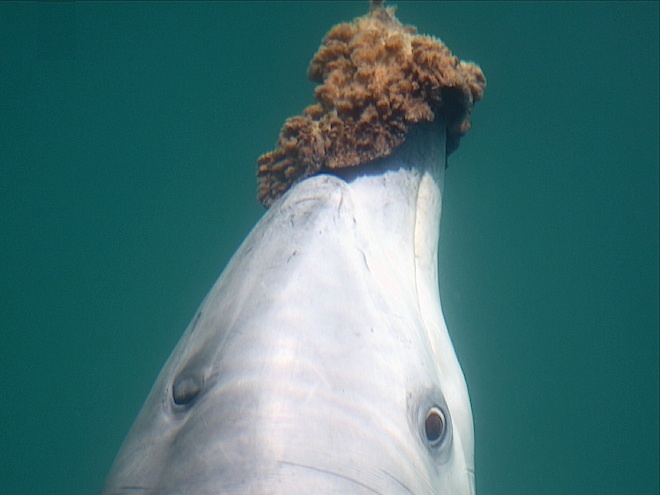 Hunting with sponges has allowed Shark Bay’s bottlenoses to fill an empty ecological niche, eating fish that other dolphins ignore, wrote Patterson and Mann. The findings also suggest why sponge foraging likely arose among Shark Bay’s females and has remained their province, taught by dolphin mothers to daughters rather than sons. Whereas dolphin fathers are mostly absent, free to roam and chase prey in the open ocean, dolphin moms spend years with their calves. They need to put food on the figurative table but have little time to do it. Sponge foraging is convenient and nutritious, a family recipe for quick-but-delicious dinners passed on to daughters who will someday need it. Citation: “The Ecological Conditions That Favor Tool Use and Innovation in Wild Bottlenose Dolphins (Tursiops sp.). By Eric Patterson & Janet Mann. PLoS ONE, July 20, 2011.